Contact Dr. John Shindler at the Alliance for the Study of School Climate (ASSC) to arrange to for your school to take the SCAI online. 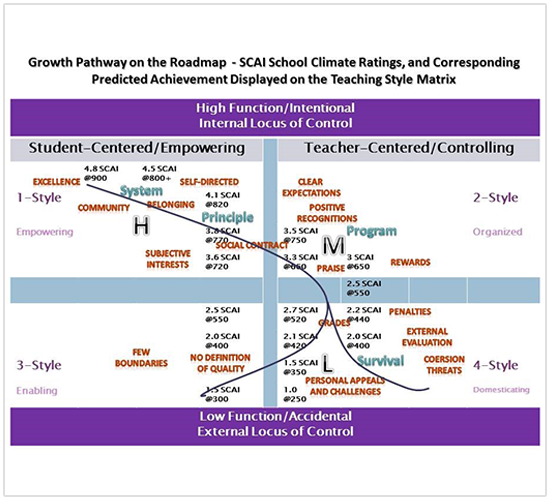 Your complete resource for School Climate Surveys, Research, Support Materials, School Leadership materials, and information on how to use the SCAI at your school. It is approved by the US DOE and has been used successfully in over 300 schools. 0.7 correlation with other key success indicators such as student achievement. Others can match that it. If you don't know where you are currently, and/or do not have a sound and reliable roadmap for guiding your improvement – How do you know where you are going?